Freezing is one of the easiest methods of preserving foods. Following the guidelines in this circular will help ensure that your frozen fruits remain nutritious and high in quality. Most fruits can be frozen satisfactorily, but the quality of the frozen product will vary with the kind of fruit, stage of maturity and type of pack. Select fruits with a firm texture and well-developed flavor and then treat them with respect. Wash small quantities (2 to 3 quarts) at a time to avoid bruising. Wash through several changes of cold water, lifting produce out of the water each time so that dirt will not settle back on the fruit. Do not let produce soak. Fruits are prepared for freezing in about the same way as for serving. It is best to prepare enough fruit for only 2 to 3 quarts at one time. If a fruit is to be crushed, suit the method to the fruit. A wire potato masher, pastry fork or slotted spoon may be used to crush soft fruits. Firm fruits may be crushed more easily with a food chopper. A colander, food press or strainer is useful for making purees. Blenders and food processors tend to liquefy the fruit too much. Do not use galvanized ware with fruit or fruit juices because the acid in fruit dissolves the zinc, which is poisonous. Metallic off-flavors may result from the use of iron utensils, chipped enameled ware or tinware that is not well tinned. Some fruits, such as apples, apricots, peaches, nectarines and pears, darken during preparation for freezer storage and darken very rapidly when thawed unless treated to etard darkening. Several ways to prevent darkening of fruit are used because all fruits are not protected equally well by all treatments. Ascorbic acid (vitamin C) is effective in preventing darkening in most fruits. Not only does it preserve natural color and flavor, but it adds nutritive value. Ascorbic acid in crystalline or powdered form is available at drugstores or where canning supplies are sold. Ascorbic acid tablets are available and may be used. They are less expensive, but more difficult to dissolve (½ teaspoon ascorbic acid = 1500 mg). Also, filler in the tablets may make the syrup cloudy. To use, dissolve ascorbic acid in a little cold water. 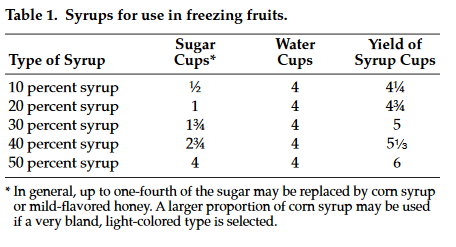 Use the amount specified for the fruit being frozen. If using tablets, crush them so they will dissolve more easily. For syrup pack, add the dissolved ascorbic acid to the cold syrup shortly before using. Stir it in gently so you won’t stir in air. Solutions of ascorbic acid should be made up as needed. Keep syrup in the refrigerator until used. For sugar or dry pack, dissolve the ascorbic acid in 2 to 3 tablespoons of cold water and sprinkle the mixture over the fruit just before adding the sugar. For unsweetened pack, sprinkle dissolved ascorbic acid over the fruit and mix thoroughly just before packing. If fruit is packed in water, dissolve the ascorbic acid in the water. For fruit juices, add ascorbic acid directly to the juice. Stir only enough to dissolve the ascorbic acid. For crushed fruits and fruit purees, add dissolved ascorbic acid to fruit preparation and mix. Ascorbic acid mixtures – special anti-darkening preparations, usually made of ascorbic acid mixed with sugar or with sugar and citric acid – are on the market. Follow the manufacturer’s directions for use. Lemon juice or citric acid is used sometimes instead of ascorbic acid. These ingredients are usually not as effective in preventing darkening as ascorbic acid. When used in large quantities, they often mask natural fruit flavors. Steaming for a few minutes before packing is enough to control darkening in some fruits. Steaming works best for fruits that will be cooked before use. There are several types of fruit packs suitable for freezing: syrup pack, unsweetened pack, sugar pack, dry pack, tray pack and sugar replacement pack. Whichever method you choose, be sure to leave the appropriate head space. Most fruits have a better texture and flavor if packed in sugar or syrup. Some can be packed satisfactorily without sweetening, but losses of vitamin C are greatest when fruits are packed without sugar. The type of pack will depend on the intended use. Fruits packed in syrup are generally best for serving uncooked; those packed in dry sugar or unsweetened are best for most cooking purposes because there is less liquid in the product. Unsweetened packs and sugar replacement packs often are used by people on special diets. Syrup pack: The proportion of sugar to water used depends on the sweetness of the fruit and the taste preference of the user. A 40 percent syrup is recommended for most fruits. Lighter syrups are desirable for mild-flavored fruits to prevent masking the flavor. Heavier syrups may be used for very sour fruits. To make syrup, dissolve the sugar in lukewarm water until the solution is clear. Cool syrup before using. Use just enough cold syrup to cover the prepared fruit after it has been settled by jarring the container (about ½ to ¾ cup of syrup per pint). To keep the fruit under the syrup, place a small piece of crumpled waxed paper or other water-resistant wrapping material on the top and press the fruit down into the syrup before closing, sealing and freezing. Combine 1 box of powdered pectin with 1 cup of water in a saucepan, and stir and boil 1 minute. Stir in ½ cup sugar and dissolve. Remove the pan from the heat and add cold water to make 2 cups of syrup. Chill. Put cleaned and prepared fruit in a 4- to 6-quart bowl; add enough pectin syrup to glaze the fruit with a thin film. Gently fold fruit to coat each piece with the syrup. Then package, seal and freeze promptly. Unsweetened pack: Fruit can be packed dry, covered with water containing ascorbic acid or packed in unsweetened juice. For fruit packed in water or juice, submerge fruit by using a small piece of crumpled water-resistant material as for syrup and sugar packs. Seal tightly and freeze. Unsweetened packs generally yield a lower quality product than packs with sugar. However, some fruits, such as raspberries, blueberries, scalded apples, gooseberries, currants, cranberries and rhubarb, maintain good quality without sugar. Sugar pack: Put fruit in a bowl or shallow pan. Sprinkle sugar over the fruit and mix gently until the juice is drawn out and the sugar is dissolved. Use a large spoon or pancake turner for mixing. Soft, sliced fruits, such as peaches, strawberries, plums and cherries, will yield sufficient syrup for covering if the fruit is layered with sugar and allowed to stand for 15 minutes. Some whole fruits may be coated with sugar and frozen. Pack fruit and juice into container. Place a small piece of crumpled water-resistant paper on top to hold fruit down in the juice. Seal and freeze. Dry pack: The dry pack is good for small whole fruits, such as berries, that give a good quality product without sugar. Simply pack the fruit into a container, seal and freeze. Tray pack: This is a good pack for the fruits mentioned above in the unsweetened pack section. Spread a single layer of prepared fruit on shallow trays. Freeze and package in freezer bags promptly. The fruit pieces remain loose. Later the bag may be opened, the needed amount taken out and the bag re-closed and returned to the freezer. Sugar replacement pack: Sugar substitutes, such as aspartame, can be used when freezing fruits. They will give a sweet taste but do not furnish the beneficial effects of sugar, such as color protection and thick syrup. Fruits frozen with sugar substitutes generally will freeze harder and thaw more slowly than those preserved with sugar. Follow directions on the label of the sweetener to determine the amount of sweetener needed. Sweeteners can be added at serving time instead of during the freezing process. Choose containers that are made for freezer storage and label with contents and date. Containers should be moisture-vapor resistant, durable and leak-proof to preserve the quality of the fruits by keeping moisture in and air out. Loss of moisture causes brownish-white spots on food known as freezer burn. Freezer burn actually does not spoil the food but can cause toughness and often results in off-flavors. Plastic freezer bags and rigid freezer containers are convenient for freezing foods. Plastic sandwich bags, bread wrappers and cartons from dairy products such as cottage cheese, sour cream or milk are not suitable for long-term freezer storage. Allow head space between packed food and closure because most fruits expand during freezing. Put no more unfrozen food into the home freezer than it will freeze within 24 hours. This is about 2 to 3 pounds per cubic foot of freezer capacity. Leave space for air circulation between unfrozen food packages. Store at 0 F or lower. For best quality, use frozen fruits within 12 months. Maintain freezer temperatures at 0 F or lower. Allow fruit to thaw in the unopened package. Fruits packed in dry sugar thaw faster than those in syrup. Fruits packed without sugar take longer to thaw. Fruit to be served in salads, shortcakes, fruit sauce and fruit cups should be only partially thawed. Thaw fruits for pies until able to separate. Completely thawed fruit will become flabby and may darken upon standing. For syrup recipe, refer to Table 1; for headspace required, see Table 2. Syrup pack: Use 40 percent syrup. For a better quality frozen product, add ½ teaspoon crystalline ascorbic acid to each quart of syrup. Slice apples directly into cold syrup in container, starting with ½ cup syrup to a pint container. Press fruit down in containers and add enough syrup to cover. Leave head space. Seal and freeze. Sugar pack: To prevent darkening of apples during preparation, dissolve ½ teaspoon ascorbic acid in 3 tablespoons water. Sprinkle over the fruit. To retard darkening, place slices in a single layer in steamer; steam 1½ to 2 minutes, depending on thickness of slice. Cool in cold water; drain. Over each quart (1¼ pounds) of apple slices, sprinkle evenly ½ cup sugar and stir. Pack apples into containers and press fruit down. Leave head space. Seal and freeze. For pies – Follow directions for sugar pack, omitting sugar. Arrange steamed slices in a pie plate as for a pie. Put the filled plate into a plastic bag and freeze. The solid chunk of slices may be removed from the plate when frozen. Wrap it tightly and return to the freezer. At pie-making time, lay the pie-shaped chunk of slices in your pastry. Put on the sugar and seasonings, top with a crust and bake. Applesauce – Select full-flavored apples. Wash apples, peel if desired, core and slice. To each quart of apple slices, add a cup water; cook until tender. Puree and add ½ cup sugar, if desired, for each quart of hot puree, stirring until dissolved. Cool and package. Seal and freeze. Apple juice – Place freshly made juice in rigid containers. Leave head space. Seal and freeze. Syrup pack: Use 40 percent syrup. For a better quality frozen product, add ¾ teaspoon crystalline ascorbic acid to each quart of syrup. Pack apricots directly into containers. Cover with syrup. Leave head space. Seal and freeze. Dissolve ¼ teaspoon crystalline ascorbic acid in 3 tablespoons of cold water and sprinkle over 1 quart (f pound) of fruit. Mix ½ cup sugar with each quart of fruit. Stir until sugar is dissolved. Pack apricots into containers and press down until fruit is covered with juice, leaving head space. Seal and freeze. Crushed or puree: Select fully ripe fruit. For crushed apricots, dip in boiling water for ½ minute and cool in cold water. Peel the apricots. Pit and crush them coarsely. For puree, pit and quarter the apricots. Press through a sieve; or heat to boiling point in just enough water to prevent scorching and then press through a sieve. For each quart (2 pounds) of prepared apricots, mix with 1 cup sugar. For a better product, dissolve ¼ teaspoon crystalline ascorbic acid in ¼ cup of water and add to the fruit just before adding the sugar. Pack into containers, leaving head space. Seal and freeze. Select avocados that yield to gentle pressure with rinds free from dark blemishes. Peel fruit, cut in half and remove pit. Avocados are best frozen as puree — unsweetened for salads and sandwiches, sweetened for other uses. Avocados are not satisfactorily frozen whole or sliced. For a better quality product, add ¼ teaspoon ascorbic acid to each quart of puree or add 1 tablespoon lemon juice for each two avocados. Pack into container, leaving head space. Seal and freeze. Select firm, ripe bananas. Peel; mash thoroughly while adding 1 teaspoon ascorbic acid per cup of mashed banana. Pack, leaving head space. Seal and freeze. Satisfactory for baking purposes. Syrup pack: Pack berries into containers and cover with cold 40 percent syrup. Leave head space. Seal and freeze. Unsweetened pack: Tray pack or pack berries into containers, leaving head space. Seal and freeze. Crushed or puree: Select fully ripened berries. Sort, wash and drain. Crush or press berries through a fine sieve for puree. To 1 quart (2 pounds) crushed berries or puree, add 1 to 1c cups sugar, depending on tartness of fruit. Stir until sugar is dissolved. Pack into containers, leaving head space. Seal and freeze. Syrup pack: Pack berries into containers and cover with cold 40 percent or 50 percent syrup, depending on the sweetness of the fruit. Leave head space. Seal and freeze. Sugar pack: To 1 quart (1a pounds) berries, add ¾ cup sugar. Turn berries over and over until most of the sugar is dissolved. Fill containers, leaving head space. Seal and freeze. Unsweetened pack: Pack berries into containers, leaving head space. Seal and freeze. Crushed or puree: Prepare for packing in the same way as whole berries. Then crush or press through a sieve for puree. To each quart (2 pounds) of crushed berries or puree, add 1 cup sugar. Stir until sugar is dissolved. Pack into containers, leaving head space. Seal and freeze. Syrup pack: Pack cherries into containers and cover with cold 50 percent syrup, depending on tartness of the cherries. Leave head space. Seal and freeze. Sugar pack: To 1 quart (1a pounds) cherries, add ¾ cup sugar. Mix until sugar is dissolved. Pack into containers, leaving head space. Seal and freeze. Select well-colored, tree-ripened fruit with a sweet flavor. Sort, stem, wash, drain and pit. Pack cherries into containers. Cover with cold 40 percent syrup. For a better quality product, add ½ teaspoon ascorbic acid to each quart of syrup. Leave head space. Seal and freeze. With sour cherries, use half sweet, half sour. Pack as above, using 50 percent syrup. Ascorbic acid may be added, but is not essential as it is for sweet cherries alone. Shred coconut meat or put it through a food chopper. Pack into containers and if desired, cover with coconut liquid. Leave head space. Seal and freeze. Whole – Choose firm, deep red cherries with glossy skins. Stem and sort. Wash and drain. Unsweetened pack: Tray pack or pack into containers without sugar. Leave head space. Seal and freeze. Syrup pack: Pack into containers. Cover with cold 50 percent syrup. Leave head space. Seal and freeze. Puree: Prepare cranberries as for freezing whole. Add 2 cups of water to each quart (1 pound) of berries. Cook until skins have popped. Press through a sieve. Add sugar to taste, about 2 cups for each quart (2 pounds) of puree. Pack into containers, leaving head space. Seal and freeze. Select plump, fully ripe, bright red currants. Wash in cold water and remove stems. Dry pack: Pack currants into containers, leaving head space. Currants also can be frozen first on a tray and then packed into containers as soon as they are frozen. Seal containers and freeze. Syrup pack: Pack currants into containers and cover with cold 50 percent syrup, leaving head space. Seal containers and freeze. Sugar pack: To each quart (1a pounds) of fruit, add ¾ cup sugar. Stir until most of the sugar is dissolved. Pack currants into containers, leaving head space. Seal and freeze. Select dates with good flavor and tender texture. Wash and split to remove pits. Leave whole or press through a sieve for puree. Dry pack: Pack into containers, leaving head space. Seal and freeze. Select fully ripe fruit, wash and peel if desired. Syrup pack: Use 40 percent syrup. For a better product, add ¾ teaspoon ascorbic acid or ½ cup lemon juice to each quart of syrup. Pack figs into containers and cover with cold syrup, leaving head space. Seal and freeze. Dry pack: To prevent darkening of light-colored figs, dissolve ¾ teaspoon of ascorbic acid in 3 tablespoons of cold water and sprinkle over 1 quart of fruit. Pack figs into containers, leaving head space. Figs also can be frozen first on a tray and then packed into containers as soon as they are frozen. Seal containers and freeze. Choose fully ripe berries if freezing for pie — berries a little underripe for jelly making. Sort, remove stems and blossom ends and wash. Syrup pack: Pack into containers. Cover with 50 percent syrup. Leave head space. Seal and freeze. Sections or slices – Select firm tree-ripened fruit heavy for its size and free from soft spots. Wash and peel. Divide fruit into sections, removing all membranes and seeds. Slice oranges if desired. For grapefruit with many seeds, cut fruit in half, remove seeds; cut or scoop out sections. Pack fruit into containers. Cover with cold 40 percent syrup made with excess fruit juice and water if needed. Leave head space. Seal and freeze. Juice – Select fruit as directed for sections. Squeeze juice from fruit, using squeezer that does not press oil from rind. Sweeten, if desired, with 2 tablespoons sugar for each quart of juice, or pack without sugar. Pour juice into containers immediately. To avoid development of off-flavors, pack juice in glass jars. Leave head space. Choose fully ripe, firm, sweet grapes. Sort, stem and wash. Leave seedless grapes whole; cut table grapes with seeds in half and remove seeds. Syrup pack: Pack into containers and cover with cold 40 percent syrup. Leave head space. Seal and freeze. Puree: Wash, stem and crush the grapes. Heat to boiling. Drain off free juice and freeze it separately. Remove seeds and hulls with a colander. To 1 quart (2 pounds) puree, add ½ cup sugar. Pack into containers, leaving head space. Seal and freeze. Juice: For beverages, select as for whole grapes. For jelly making, select as recommended in specific jelly recipe. Crush grapes. Add 1 cup water per gallon of crushed grapes. Simmer for 10 minutes. Strain juice through a jelly bag. To remove tartrate crystals, let stand overnight in refrigerator or other cool place. Pour off clear juice for freezing. Discard sentiment. Pour juice into containers, leaving head space. Seal and freeze. If tartrate crystals form in frozen juice, they may be removed by straining the juice after it thaws. Husk. Scald for 2 minutes. Pack in 40 percent syrup. Leave head space. Seal and freeze. Select ripe, tender fruit. Wash, peel and cut in half. Syrup pack: Pack in container. Cover with cold 30 percent syrup. Leave head space. Seal and freeze. Select firm, ripe mangos that yield to gentle pressure. Wash, peel and slice. Syrup pack: Pack slices in containers. Cover with 30 percent syrup. Leave head space. Seal and freeze. Unsweetened tray pack: Arrange slices on a flat pan and freeze. When frozen, remove and store in sealed containers. Puree: Press mango slices through a sieve, blender chop or chop in a food processor. Pack into containers with or without sugar. Leave head space. Seal and freeze. Syrup pack: Select firm-fleshed, well-colored melons. Cut in half, remove seeds and peel. Cut melons into slices, cubes or balls. Pack into containers and cover with cold 30 percent syrup. Leave head space. Seal and freeze. Unsweetened pack: Select and prepare as for syrup pack. Place in freezer bag. Seal and freeze. Serve before completely thawed. Halves, quarters or slices – Choose fully ripe, well-colored, firm nectarines. Overripe fruit may take on a disagreeable flavor in frozen storage. Sort, wash and pit the fruit. Peel if desired. Cut in halves, quarters or slices. Cut fruit directly into cold 40 percent syrup, starting with ½ cup for each pint container. For a better product, add ½ teaspoon crystalline ascorbic acid to each quart of syrup. Press fruit down and add syrup to cover, leaving head space. Seal and freeze. Puree – Prepare same as peach puree below. Halves and slices - Peaches in halves and slices have better quality when packed in sugar, but a pectin syrup pack will serve if sweetening is not desired. Select firm, ripe peaches with no green color in the skins. Sort, wash, pit and peel. For a better product, peel peaches without a boiling-water dip. Slice if desired. Syrup pack: Use 40 percent syrup. For a better quality product, add ½ teaspoon crystalline ascorbic acid for each quart of syrup. Put peaches directly into cold syrup in container, starting with ½ cup syrup to a pint container. Press fruit down and add syrup to cover, leaving head space. Seal and freeze. Sugar pack: To each quart (1/3 pounds) of prepared fruit, add 2/3 cup sugar and mix well. To retard darkening, sprinkle ascorbic acid dissolved in water over the peaches before adding sugar. Use ¼ teaspoon crystalline ascorbic acid in 3 tablespoons cold water for each quart of fruit. Pack into containers, leaving head space. Seal and freeze. Pectin syrup pack: Pack peaches into containers and cover with cold pectin syrup (see page 2). Leave head space. Seal and freeze. Puree: To loosen skins, dip peaches in boiling water ½ to 1 minute. The riper the fruit, the less scalding needed. Cool in cold water, remove skins and pit. To puree, press through a sieve, or heat pitted peaches 4 minutes in just enough water to prevent scorching and then press through a sieve. With each quart (2 pounds) of pureed peaches, mix 1 cup sugar. For better quality, add c teaspoon crystalline ascorbic acid to each quart of fruit. Halves or quarters – Select pears that are ripened and firm but not hard. Wash fruit in cold water. Peel, cut in halves or quarters and remove cores. Heat pears in boiling water or 40 percent syrup for 1 to 2 minutes, depending on size of pieces. Drain and cool. Pack pears into containers and cover with cold 40 percent syrup. For a better product, add ¾ teaspoon crystalline ascorbic acid to a quart of cold syrup. Leave head space. Seal and freeze. Select orange-colored, soft, ripe persimmons. Sort, wash, peel and cut into sections. Press fruit through a sieve to make a puree. For a better product, to each quart of puree add c teaspoon ascorbic acid. Puree made from native varieties needs no sugar. Puree made from cultivated varieties may be packed with or without sugar. Puree: Pack unsweetened puree into containers. Leave head space. Seal and freeze. Or mix 1 cup sugar with each quart (2 pounds) puree and pack into containers. Leave head space. Seal and freeze. Select firm, ripe pineapples with full flavor and aroma. Pare and remove core and eyes. Slice, dice, crush or cut the pineapple into wedges or sticks. Unsweetened pack: Pack fruit tightly into containers without sugar. Leave head space. Seal and freeze. Syrup pack: Pack fruit tightly into containers. Cover with 30 percent syrup made with pineapple juice, if available, or with water. Leave head space. Seal and freeze. Dry pack: Pack fruit tightly into containers without sugar. Leave head space. Seal and freeze. 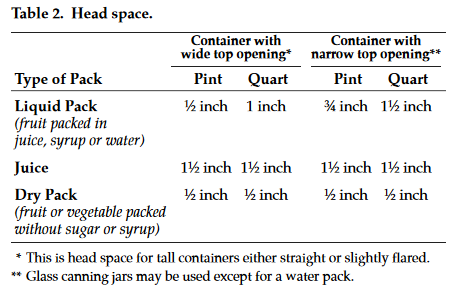 Unsweetened pack: Pack whole fruit into containers, leaving head space. Seal and freeze. To serve uncooked, dip frozen fruit in cold water for 5 to 10 seconds, remove skins and cover with 40 percent syrup to thaw. Syrup pack: Pack cut fruit into containers. Cover fruit with cold 40 percent or 50 percent syrup, depending on tartness of fruit. For improved quality, add ½ teaspoon crystalline ascorbic acid to a quart of syrup. Leave head space. Seal and freeze. Plum sauce: Boil well-ripened clingstone plums without water until soft, then remove pits and skins. Continue cooking the pulp and juice until it thickens. Add one part sugar (with spices, if desired) to four parts plums. Cool and package, leaving head space. Seal and freeze. Select fully ripe pomegranates. Wash and cut in half. Place cut side down and rap the shell with a blunt instrument, such as a hammer handle. This will break section walls and open juice sacs. Syrup pack: Pack juice and pulp into containers. Cover with a cold 30 percent syrup, leaving head space. Seal and freeze. Whole – Select fully ripe, juicy berries. Sort, wash carefully in cold water and drain thoroughly. Sugar pack: To 1 quart (1a pounds) berries, add ¾ cup sugar and mix carefully to avoid crushing. Put into containers, leaving head space. Seal and freeze. Syrup pack: Put berries into containers and cover with cold 40 percent syrup, leaving head space. Seal and freeze. Unsweetened pack: Put berries into containers, leaving head space. Seal and freeze. Crushed or puree: Prepare as for whole raspberries, then crush or press through a sieve for puree. To 1 quart (2 pounds) crushed berries or puree, add ¾ to 1 cup sugar, depending on sweetness of fruit. Mix until sugar is dissolved. Put into containers, leaving head space. Seal and freeze. Stalks or pieces – Choose firm, tender, well-colored stalks with good flavor and few fibers. Wash, trim and cut into 1- or 2-inch pieces or in lengths to fit the package. Heating rhubarb in boiling water for 1 minute and cooling promptly in cold water helps retain color and flavor. Unsweetened pack: Tray pack or pack either raw or preheated rhubarb tightly into containers without sugar. Leave head space. Seal and freeze. Pie pack: Use directions given for apples. Syrup pack: Pack either raw or preheated rhubarb tightly into containers, cover with cold 40 percent syrup. Leave head space. Seal and freeze. Sugar pack: Mix either raw or preheated rhubarb with ½ cup sugar per quart of prepared fruit. Pack, leave head space. Seal and freeze. Whole – Choose firm, ripe, red berries preferably with a slightly tart flavor. Large berries are better sliced or crushed. Sort berries, wash them in cold water, drain well and remove hulls. Syrup pack: Put berries into containers and cover with cold 50 percent syrup, leaving head space. Seal and freeze. Sugar pack: Add ¾ cup sugar to 1 quart (1a pounds) strawberries. Stir until most of the sugar is dissolved or let stand for 15 minutes. Put into containers, leaving head space. Seal and freeze. Unsweetened pack: Tray pack or pack into containers, leaving head space. For better color, cover with water containing ascorbic acid for each quart of water. Seal and freeze. Sliced or crushed – Prepare for packing as for whole strawberries; then slice or crush partially or completely. To 1 quart (1a pounds) berries, add ¾ cup sugar; mix thoroughly. Pack into containers, leaving head space. Seal and freeze. Puree – Prepare strawberries as for freezing whole. Then press berries through a sieve. To 1 quart (2 pounds) puree, add b cup sugar and mix well. Put into containers, leaving head space. Seal and freeze. For more information about food preservation, contact your local office of the NDSU Extension Service.